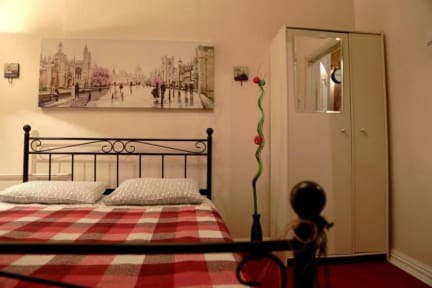 The hostel is located in the center of Minsk, near two big squares - Minsk Victory Square and Yakuba Kolasa Square, 1 km from National Academic Big Opera and Ballet Theatre. Just a 3-minute walk from Ploshchad Pobedy Metro Station. Minsk-2 Airport is 30.6 km away. We offer transfer. We offer 2 shared rooms with 4 beds in each and private rooms with double bed in each. All rooms are clean and cozy. Kitchen and bathroom are shared, they are fully equipped: a hair dryer, soap, shampoo, dishes, a gas-stove, a fridge, a kettle, a microwave, cutlery and crockery. Reception is open from 9:00 till 20:00.